Although you’ll find apps aligned with the various levels of Bloom’s, choosing apps labeled at a higher level of won’t guarantee students will be working at that level. It’s HOW the app is used and the task they complete that determines the true level of application, not the app itself. However, certain apps, by nature of their design and function, facilitate task completion where students reach the higher levels. So, where do you begin looking for apps that can help facilitate working at the higher level of Bloom’s? Let’s start with the “Pad”agogy Wheel (pictured at the left) by Allan Carrington. What’s the Padagogy Wheel? Allan Carrington, the designer, has taken the concept of Bloom’s Digital Taxonomy, which aligns digital tasks to each level, and kicked it up a notch by adding iPad apps. The wheel pictured here is version 2.0 of the wheel with the SAMR model added as an outer ring. 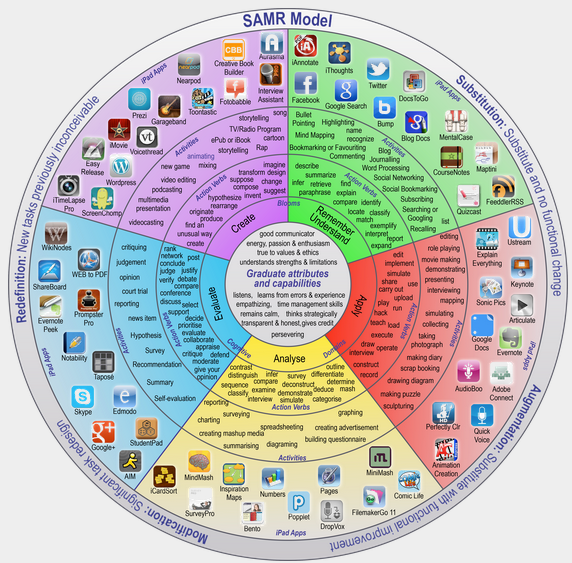 Notice that the higher levels of SAMR correlate to the higher levels of Bloom’s Taxonomy. For additional resources that have aligned apps with Bloom’s Taxonomy, scroll down the page. Download the PDF poster with clickable links to apps. Embedded Google spreadsheet of apps categorized by subject area, with task verbs and Bloom’s. (See the links/tabs at the bottom for subject areas). Links to each level of Bloom’s Taxonomy with clickable links to individual apps. There is a link on this page to each level of Bloom’s Taxonomy.